Michigan Hand and Wrist, PC was founded in 2001 by Dr. Jean-Paul Guiboux with the mission to provide the highest quality patient care. We offer comprehensive adult and pediatric care for the shoulder, elbow, wrist and hand. 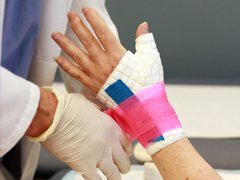 This includes surgical care for upper extremities, fractures, tendon lacerations and injuries, joint replacement for arthritis, arthroscopy, nerve decompression, repairs and microsurgery.